Around 6-8 hours north of Metro Manila is this small city nestled in the mountains of Benguet province. 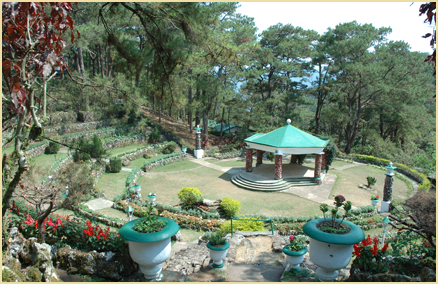 Baguio enjoys a year-round flow of local and foreign tourists wanting to escape the torrid temperature of the lowlands. It is, however, during the Philippine summer months of March, April and May that the city bustles with sightseers, earning it the monicker “Summer Capital of the Philippines”. For your guests, the city is chock-full of tourist attractions that have been developed in its century-old history. Families will have endless fun in the American heritage sites, parks, flower gardens, churches and other religious monuments. Food connoisseurs will enjoy the multitude of restaurants, coffee shops, vegetable farms and fresh food markets. 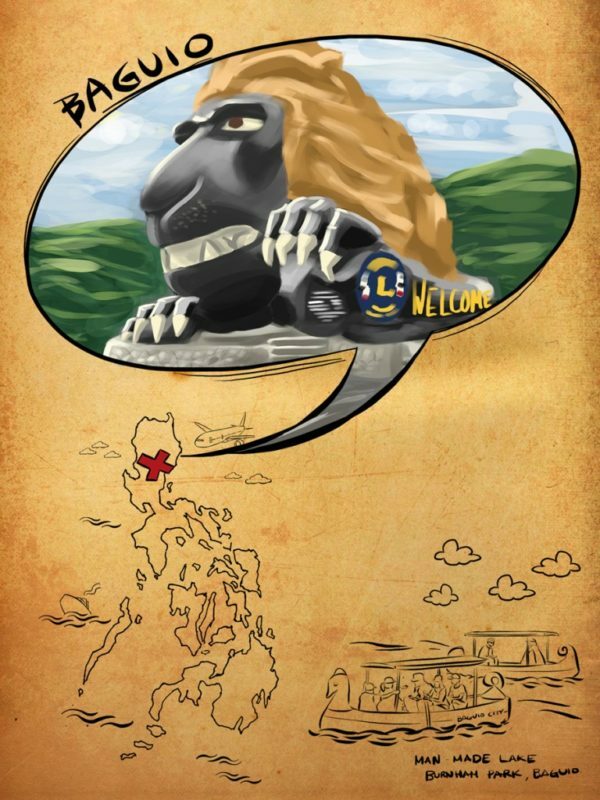 For history and culture buffs, there are ethnic Igorot villages, artist communes, bookstores and antique shops. In the month of February, Baguio City hosts the annual Panagbenga Festival, its very own Flower Festival in which the locals celebrate and exhibit beautiful and colorful flowers grown in the city. All these together, and the rustic fascinating charm you can feel through narrow winding roads, towering pine trees and surrounding bucolic architecture, Baguio has become a dreamed destination for weddings and honeymoons. Here are some wedding invitations we’ve done for weddings in Baguio City. 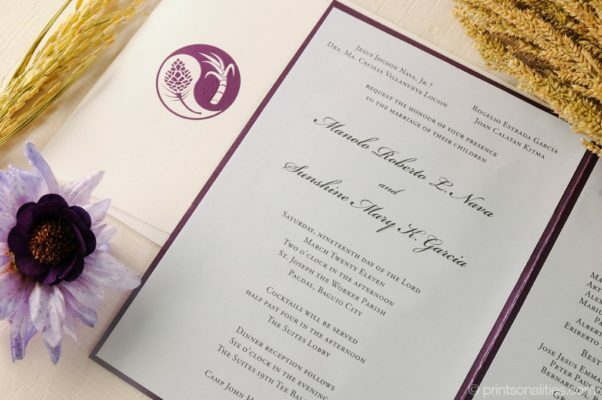 A yin-yang of sugarcane and pinecone was the centerpiece of this purple and silver pocketfold invitation. This invitation symbolizes the coming together of two strong forces, entwined and harmonized as one. The couple’s wedding was held in St. Joseph the Worker Parish where Filipino celebrities Aga Muhlach and Charlene Gonzales got married in 2001. 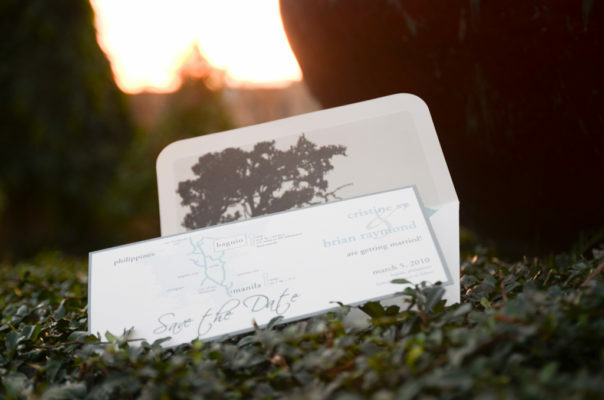 Complete with a save-the-date card, this invitation adorned with a picturesque tree illustration perfectly conveyed the city’s mountainous landscapes. The wedding was held in the majestic Baguio Cathedral also known as Our Lady of Atonement Cathedral. Destination weddings are fun and memorable especially if everybody can enjoy and appreciate the destination of choice. Planning for an out-of-town wedding can be tricky, but once you dream for it and everything’s properly laid out, a Baguio wedding – be it an intimate garden wedding, a church wedding, or a country-themed wedding – will always remain as a beautiful memory in the hearts of everyone. 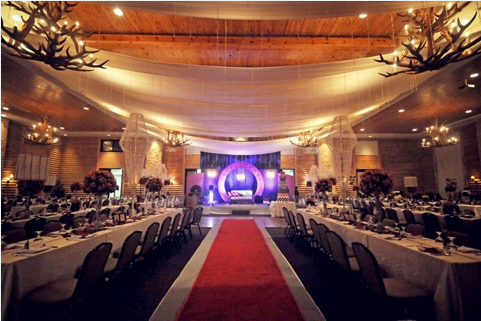 This entry was posted in Destination Weddings. Bookmark the permalink. This is the blog of Printsonalities where we share stories about incredible paper creations. Read on and get inspired!